Following the Fall Bus Tour it was time to catch up with with the full membership for an autumn "Cellar-bration" in Vancouver. The private suite at The Blackbird made for a great venue to sample carefully curated wines from the Society cellar. Everything from Blue Mountain Brut to Forbidden Fruit Apricot Mistelle dessert wine was on hand, including two Lieutenant Governor's Award-winning wines, and even the decade-plus 2006 Black Hill Nota Bene. Fine food from Blackbird's kitchen brought it all together and offered plenty of pairing opportunities to savour wines from several stellar vintages. Twelve years of fall Bus Tours still going strong as we visited the south Okanagan and toured several Oliver-Osoyoos wineries. This year's sold out tour brought a busload of wine fans to private tastings at Le Vieux Pin, Tinhorn Creek, Gehringer Brothers, Maverick, Moon Curser, Gold Hill, and Bartier Bros. The talented tasters took in a long-table lunch at Tinhorn's Miradoro Restaurant on Saturday, and then a wine tasting and patio lunch at LaStella Winery on day two - facilitated by who else but Joy Road Catering! A winemaker's dinner at Adega on 45th overlooking Osoyoos Lake was a hit with a finely crafted menu from Shayna & Shulman Catering. Fortunately our Osoyoos hotel included a pool and hot tub in which to continue post-tasting traditions all weekend long. The almost-annual summer barbecue was a huge hit once again thanks to the generosity of members Larry & Maggie in opening up their beautiful backyard. In the past, this has been a pot-luck event, but this year, all the food was provided by our very own corporate member Trish, owner of Casalinga Foods. Highlights included Steak & Prawn Skewers, Lamb Popsicles, Thai Chicken Skewers, BBQ Ribs, Corn on the Cob and lots of delicious salads and sweet treats. 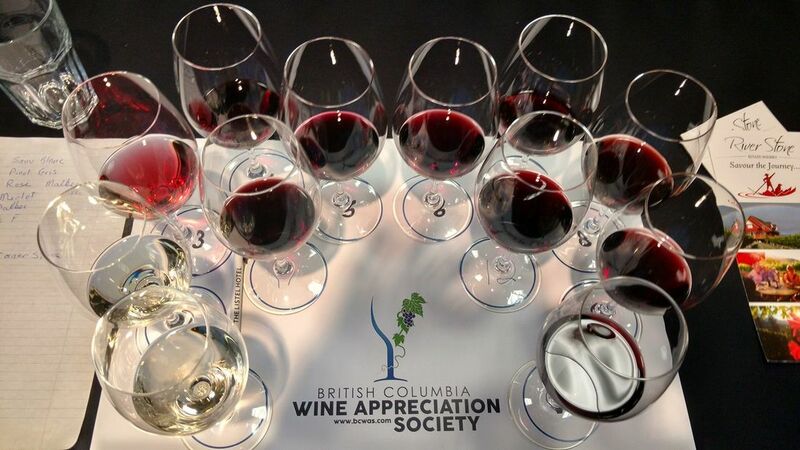 A full selection of wines from the Society cellar included some beauties from Bordertown, Deep Roots, Eau Vivre, Fairview Cellars, Howling Bluff, LaStella, Road 13, and Stoneboat, with the crowd favourite being Intersection's delicious Cabernet Franc. We were even lucky enough to be joined by legendary Canadian wine author - and fellow BCWAS member - John Schreiner, who to signed copies of his new book "Icon", summarizing British Columbia's top wines and wineries. 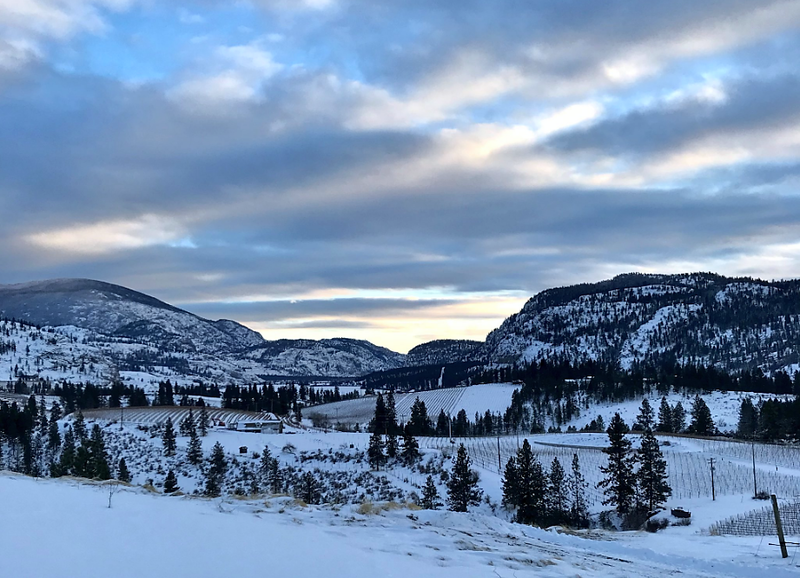 Local legend Harry McWatters took some time out of his very busy schedule opening a brand new urban winery in Penticton to share his latest wines with us in Vancouver. 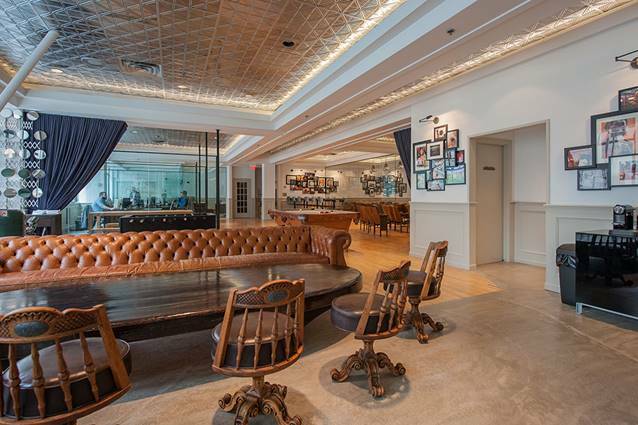 The TIME Winery being installed in a renovated theater will be totally unique in BC, and our members are looking forward to seeing Harry there in person once the doors open later this year. At the Diamond Ballroom overlooking False Creek, Harry brought wines that ranged from Riesling to Rose, and Viognier to Syrah. We even encountered a rare taste of the new flagship red he is releasing, "Chronos". The pair of White & Red Meritage blends also offered a taste of the rich Bordeaux-styled blends Harry has been fine-tuning since he introduced the Meritage nomenclature to BC after launching Sumac Ridge. Full-bodied, creamy New World Chardonnay was another treat, and Black Sage Bench varietal Cabernet Franc came to us from Harry's original, ground-breaking plantings of 1993. The Society was happy to honour Harry's loyalty and generosity, and long-time industry leadership, with a gift to mark the occasion at the end of our tasting. Downtown Vancouver's flagship Glowbal restaurant welcomed us for a five-course dinner featuring the wines and company of Luke Smith, proprietor and winemaker at Howling Bluff on the Naramata Bench. Luke's wines have netted him three Lieutenant Governor's Awards, and as it turned out a fourth was to follow just after our dinner with him: the yet-to-be-released 2013 Century Block Pinot Noir we enjoyed with Yarrow Meadows Duck Breast was named one of twelve winners this year. Another Pinot Noir (2013 Three Mile Vineyard) was paired with Roasted Lamb Loin or Wild Mushrooms, and a third concluded the meal as we relished 2009 Fortified Dessert Wine. Luke's much-loved Sauvignon Blanc Semillon was also present to start the meal with Hamachi Crudo, and the 2012 Sin Cera red blend made a great match for Beef Tenderloin or Onion & Blue Cheese Tart. The Society's long-time friendship with Luke made for a memorable and fun-filled meal at an impressive venue many of us were happy to explore for the first time. Ted and Lorraine Kane brought the rich range of wines from their Oliver winery to Vancouver to share with us. As we all await the release of 2016 whites, we relished the chance to finish off the 2015 vintage of Sauvignon Blanc and Pinot Gris, seeing the benefit of just a hint of age on these complex varietals, still fresh and fruit forward as Ted intends them. A sample of 2015 Rose provided the very rare opportunity to witness Malbec in Rose form, a technique attempted by only a handful of British Columbia wineries. The Kane's Cabernet Franc has been particularly renowned, and sampling the 2014 showed it to be in fine form from a solid vintage. Lastly, we were extremely lucky to experience a six-year vertical of the winery's flagship red blend, "Cornerstone". Always a valuable opportunity, a vertical tasting offers superb comparisons, in this case showing the range of 2009-2014 vintages, plus the 2014 hasn't even been released yet! 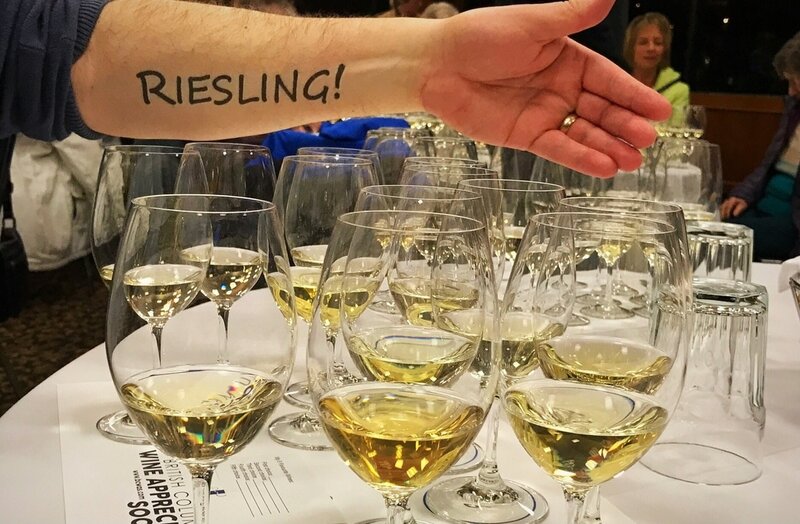 The fourth almost-annual double blind tasting challenge featured a white wine for the first time: several of BC's darling Riesling faced off against one another and some international competition. We had the honour of being joined by Rolf de Bruin from Lillooet's Fort Berens Estate Winery - whose own Riesling has recently expanded in scope with two versions emerging. The ultimate champion after counting votes was Synchromesh's 2015 Storm Haven Vineyard - one of several site-specific gems from Alan Dickinson's Okanagan Falls ode to this grand grape. Close competition from Germany's Nik Weis St. Urbans-Hof was followed up by local favourites St. Hubertus and 8th Generation to round out the stand-out four. Washington's Eroica tied with Fort Berens before Orofino, Intrigue, Tantalus, and Culmina found favour. Australia's Pewsey Vale Eden Valley had fans as well, but sadly our Alsation representation was oxidized! While the Vancouver International Wine Festival brought the nation's finest to the city in celebration of Canada 150 we hosted a live "Tweet-up" at the beautiful Chali-Rosso Art Gallery. Original masterworks on display included dozen's of stunning Salvador Dali sculptures and prints, keeping us on our best behaviour as two dozen Canadian wineries served samples. The weekly #BCwinechat Twitter discussion championed by Sandra Oldfield was enhanced by this rare live meeting of minds, with plenty to discuss thanks to the many generous winery guests. Abundant food kept everyone upright and all artwork safely secure amidst nearly too many stellar wines to count. Best of all the event raised $1000 for the BC Hospitality Foundation, going towards scholarships and financial support for injured or otherwise needy individuals within the hospitality industry. After many years of patient collecting under the supervision of the Society's wise Cellarmasters, a full decade's worth of iconic Portfolio was ready to enjoy. The flagship wine of Laughing Stock was under the microscope as we sampled 2004-2013 vintages alongside owners David & Cynthia Enns. Fortunately, and to little surprise, the vertical tasting was a rousing success, showing the age-ability and complexity of this highly revered Bordeaux-style red blend. Hard to believe the event got even better when the Enns' shared their very rare new Port "Dark Pool" - an aged 2010 Merlot fortified with spirit from the same vineyard's lees during five years of oak aging. Imagine Cynthia's surprise when David revealed this secret project after showing her the two puncheons willing away the days in a quiet corner!